By Sean Jones: Already looking in great shape, WBA/WBC middleweight champion Saul Canelo Alvarez is training hard for his May 4 unification fight against IBF champion Daniel Jacobs (35-2, 29 Os) on DAZN at the T-Mobile Arena in Las Vegas, Nevada. Canelo posted a training clip of him hitting the heavy bag at his gym, and he’s looking powerful and committed to winning on May 4 against Jacobs. On paper, Jacobs, 5’11”, poses problems for the 5’8″ Canelo due to his height, reach, hand speed, power and his ring IQ. Jacobs isn’t just an average fighter like we’ve seen Canelo beating in the recent past against Rocky Fielding, Julio Cesar Chavez Jr. and Amir Khan. Jacobs is more on the same level as Gennady Golovkin, who gave Canelo all kinds of problems in their two fights. Although Canelo got out of the two matches against Golovkin without losing to him, he was perceived as not having proved that he was better than him because of the judging for the 2 matches. Jacobs says he thinks Canelo lost both fights with GGG, and he’s VERY concerned with how his fight against the Mexican star will be judges, given that their fight is taking place at the same venue [T-Mobile Arena in Las Vegas] as the two Golovkin fights took place. 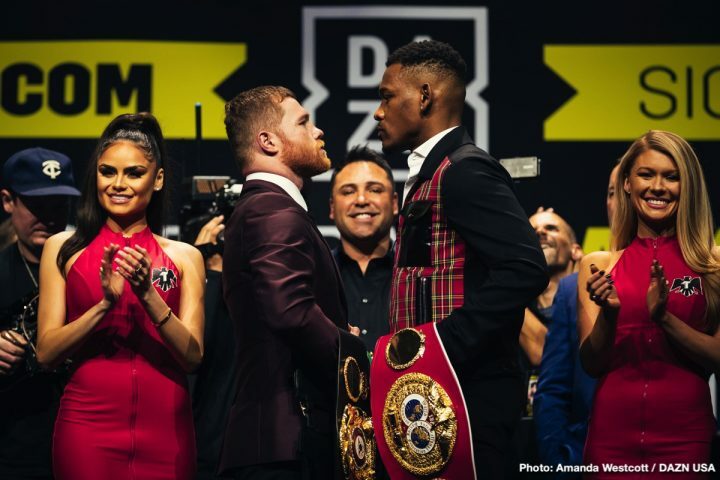 Golden Boy Promotions CEO Oscar De La Hoya recognizes that Jacobs, 32, is someone that is a real threat to beating Alvarez, and he has some tips that he thinks he should follow to ensure that he’s victorious on May 4 over the New Yorker Jacobs. De La Hoya says Canelo should fight the way that boxing great Julio Cesar Chavez fought by fighting in a crouch, and walking down Jacobs. De La Hoya notes that Jacobs has been hurt in the past in his fight against Dmitry Pirog in 2010, so that’s a sign that it can happen again. “I would tell him to study Chavez, you know? Meaning he would have to go in there, crouch down just a little bit, moving your head, and just keep treading, you know, keep going in an throw combinations,” De La Hoya said to Fighthub. “Because if you think you’re going to outbox Daniel Jacobs it’s going to be very difficult. It’s easier to go inside and work the body. The body is the one; you have to break him down and hopefully he’ll fall,” De La Hoya said. It sounds like De La Hoya hasn’t watched a lot of Jacobs’ past fights, because it’s going to be next to impossible for Canelo to work his way to the inside against the highly mobile Jacobs. It’s possible that Canelo will eventually get a chance to throw some shots in close, but that likely won’t happen until the second half of the fight when Danny tires a little from moving. Canelo is even shorter than Jacobs’ last opponent Sergiy Derevyanchenko, 5’9″, and he struggled with the long reach advantage that Jacobs had over him in their fight last October. Derevyanchenko was smart in coming forward with fast feet to pursue Jacobs all night long to force him to brawl in close. It didn’t work out though for Derevyanchenko, as he walked into a lot of shots from Danny, and ended up losing the fight. No matter how much head and upper body movement Canelo uses in the fight, he’s going to get hit a lot by Jacobs when/if he comes after him the way he did in walking down his last two opponents Fielding and Golovkin. Jacobs will be making a mistake if he tries to knockout Canelo. That’s unlikely to happen, considering that Canelo takes a really good shot, and he’s excellent at rolling with the punches. The only times that Canelo was hurt in his two fights against Golovkin was in the second fight when he was hit with some tremendous uppercuts while coming forward in a crouch. Golovkin timed Canelo and landed two uppercuts that he couldn’t roll with, and he was clearly hurt. The way to beat Canelo is with volume punching. Jacobs will need to throw a lot of power shots to get the decision due to this being Canelo’s venue at the T-Mobile Arena in Las Vegas. Jabbing Canelo probably don’t get Jacobs the decision. He’ll need to unload on him with a lot of shots the same way that IBF welterweight champion Errol Spence Jr. did in beating Mikey Garcia last Saturday night. Spence wasn’t trying to load up on anything big. He was just focusing on hitting Mikey with everything he could to win rounds, and possibly get a stoppage due to the sheer numbers of shots. If Jacobs can throw over 1,000 punches, with most of them power shots, and not get hurt or knocked down, he’ll have a good chance of winning the fight. It’s unclear whether Jacobs is capable of throwing a lot of punches. He’s never done that before in any of his fights. He’s more of a boxer/puncher type, who hits and moves. Obviously, fighting like that, Jacobs won’t land a lot of shots on Canelo, which make it hard for him to be given the decision against the highly popular home fighter Canelo. What Canelo did in his two fights against Golovkin isn’t that complex. Although some boxing fans and media members have magnified Canelo’s game plan on the two GGG fights and see it as a masterpiece, the reality is, it wasn’t a masterpiece. In the first fight with Golovkin in 2017, Canelo pinned himself to the ropes, and moved to his left all night long. Golovkin took advantage of the poor game plan by Canelo by hitting him with jabs from long range. The judges scoring that fight as a draw was quite controversial, being that the boxing world saw it as a clear win for Golovkin. The judging was so bad for that fight, that it put Canelo in an unfavorable light in the eyes of the boxing fans. To some, it made Canelo look like a pampered fighter, given preferential treatment by the judges. In the rematch with Golovkin, Canelo merely walked forward and look to engage. Again, this wasn’t rocket science. The only reason it seemed like a genius move at time in the eyes of some boxing fans is because Golovkin made the mistake of backing up to the center of the ring. He didn’t back up further. He would back up to the center of the ring and fight. Canelo won’t be able to use the same game plans for the third fight with GGG, because he knows he likely be given the decision if he jabs Canelo from the outside all night like Mayweather did or if he backs up to the center of the ring. Golovkin will need to fight it out in one spot against Canelo for him to win. But against Jacobs, Canelo is probably going to stalk him the same way Pirog, Derevyanchenko and Golovkin did, because it worked. Jacobs needs to understand that if he moves all night long against Canelo, he probably won’t be given the decision. For Jacobs to repeat the past mistakes that he made in his fights against GGG, Derevyanchenko and Pirog, it would suggest that he was just coming to survive on May 4 and not try and win the fight. If Jacobs flurries on Canelo the way he did in his wins over Peter Quillin and Sergio Mora, the fight with Canelo might not last more than four rounds. Canelo will be knocked out if Jacobs unloads with a storm of shots in the first four rounds. That’s the way to beat Canelo. The Mexican star does not do well when he gets caught in prolonged flurries. Canelo gets tired, his form breaks down, and he gets clipped. If you watch Canelo’s fights against Jose Miguel Cotto and the last seconds of the 12th round his first fight with Golovkin, he looked poor when those fighters were unloading on him with a prolonged flurry of shots. Canelo’s single punch power disappeared, he looked tired, and he was vulnerable. If Jacobs chooses to unload on Canelo right from the start, he could knock him out in the first round like he did against Quillin. “Well the fact that he can get hurt tells you a lot,” De La Hoya said. “But like you said, it was a long time ago. And Canelo’s not banking on that. He’s banking on Canelo’s skills, that’s what he’s banking on. I think Canelo has to stay focused with his game plan and stick with it,” De La Hoya said. Like in his two fights against GGG, Canelo will come into the contest with Jacobs with a game plan, and he’ll try and stick with it. But if it’s not working, then he’ll go to the ropes and use head movement or he’ll come forward and try and walk Jacobs down. I mean, those are the only things that Canelo has ever done in his fights in terms of different styles. Canelo’s not capable of using a lot of side to side movements due to his tank-like build and his short, Babe Ruth-like, chicken legs. If Canelo is getting the worst of it when coming forward, then he’ll back up to the ropes, and try and look slick with head and upper body movement like he used against Golovkin in the first fight, and in the Austin Trout fight. Canelo is not effective when he’s against the ropes, but the judges still give him rounds when he’s fighting in that style. It doesn’t matter that Canelo eats jabs for breakfast when he’s up against the ropes, the judges still give him rounds. Given that he can win just by fighting with his back against the ropes and moving his head, Canelo might be better off using that as his primary game plan against Jacobs on May 4. As the saying goes, ‘if it’s not broke, why fix it?’ Canelo can win just by making Jacobs miss with his shots against the ropes. Of course, if Jacobs flurries on Canelo like he did against Quillin, it could be game over for him. The fight will be stopped early, and the judges won’t have a say in the final outcome of the fight.